Sunday (Sunnie) Enessi Ododo is a poet, dramatist, stage designer and scriptwriter who speaks Ebira,Yoruba, Hausa and English. Born in Maiduguri, Nigeria, in 1962, he studied Performing Arts and Theatre Arts at the Universities of Ilorin and Ibadan respectively and has a PhD in Performing Arts from the University of Ilorin. A senior lecturer in the Department of Creative Arts at the University of Maiduguri, Nigeria, he has designed and produced many stage plays. His versatile writings include several genres: The Revelation (TV drama screened by NTA Yola, Nigeria), 1987; To Return from the Void (opera), 1998; Vanishing Vapour (dance libretto), 2006; and Hard Choice (drama), 2008. His poems have appeared in anthologies such as Rising Voices: An Anthology of New Nigerian Poetry, 1991, and Camouflage: Best of Contemporary Writing from Nigeria, 2006. His scholarly work has gained considerable attention, especially his ‘Facekuerade theory’, which derives from the maskless transformational practices of traditional Ebira masquerades (eku). He has also edited journals like Alore: Ilorin Journal of the Humanities and The Performer: Ilorin Journal of the Performing Arts, and his essays have been published in journals in the USA, the UK and Nigeria, including: ‘Womanhood and Virgo Intacta: Form and Aesthetic Reconstruction in Ovia-Osese Performance’ in Ufahamu: A Journal of African Studies 30 (2/3) 2004; and ‘“Facekuerade”: The Transformational Duality in Ebira-Ekuechi Festival Performance,’ Cultural Studies 22 (2) 2008. With Duro Oni, he has co-edited Technical Theatre Practice in Nigeria: Trends and Issues (Lagos: Centre for Black and African Arts and Civilisation – CBAAC, 2006), He is on the editorial board of The Perfformio, a University of Wales onlinejournal for the performing arts, (http://perfformio.org/default.aspx). 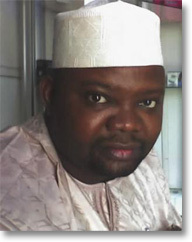 A member of the Association of Nigerian Authors (ANA), he is chief judge of ANA literary prizes. He currently serves as vice-president of the Society of Nigerian Theatre Artists (SONTA). Ebira is one of three largest of the Nupoid languages, with an estimated one million speakers (1989). Spoken in the region north and west of the confluence of the Niger and Benue rivers, the language is used in administration, commerce and religious services, and is taught in schools and at colleges of education.